Example of nearshore coral loss near Key West, Florida. 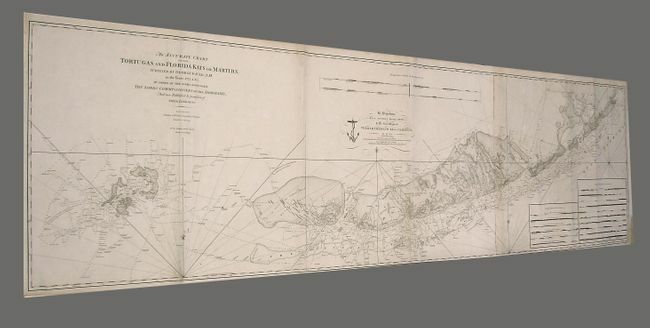 (A) Excerpt of Guald’s 1774 nautical chart, with locations of coral indicated with black rectangles. The inset shows an enlarged image of two adjacent historical coral references. 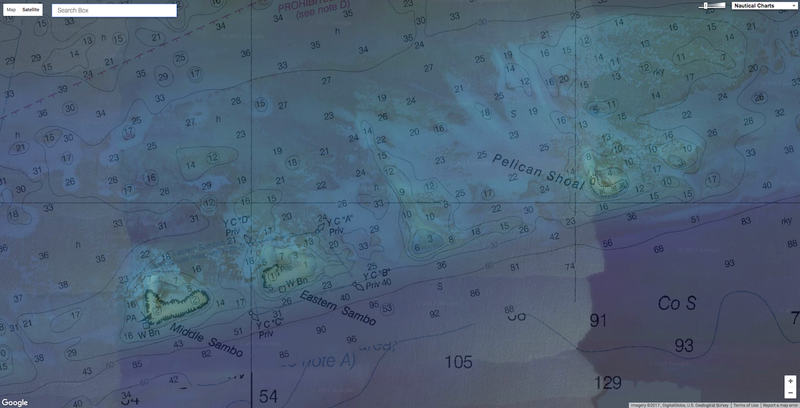 (B) Same area today, represented by Google Earth imagery overlaid on the compiled modern benthic habitat map. Black rectangles indicate areas of coral persistence; gray rectangles indicate coral loss. In the Florida Keys, researchers have found an important new way to estimate what’s been lost. In 1774 and 1775, as the upper part of North America girded for war, a British surveyor named George Gauld was sailing around the Florida Keys, putting together maps. The British Admiralty had sent him, and he made a point of marking, directly on his charts, wherever the natural landscape could affect naval movement. “The Bank is full of Coral Patches and no Vessel ought to venture into less than 3 fathoms,” he wrote along the coast of one island in the South Keys. Nearly two and a half centuries later, a different group of people are eager to know what he found. For a recent paper in Science Advances, a group of environmental scientists and historians teamed up to compare Gauld’s detailed maps to contemporary satellite surveys of coral reefs, in order to calculate how much reef cover has diminished over the past 250 years. This long view, they think, could provide a more nuanced look at where coral is, was, and could be. 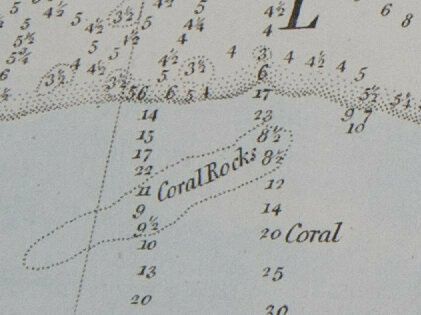 A detail of Gauld’s 1774 map, demonstrating his precise coral recording. Scientists hoping to get a handle on historic species populations have long turned to creative sources, many repurposed from more commercial endeavors. Researchers working on the Census of Marine Life’s History of Marine Animal Populations project, for example, have looked at whaling records, fishery statistics, and even restaurant menus to estimate species counts. 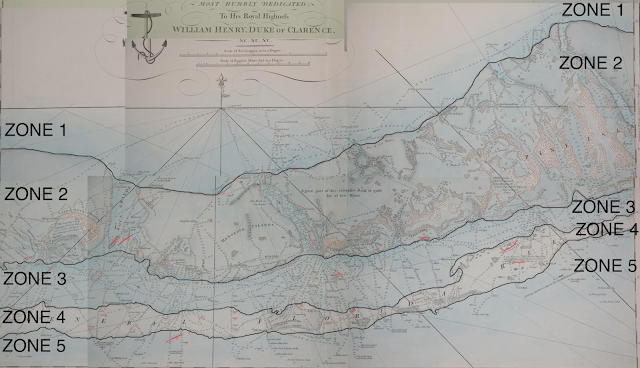 Oyster fisheries have mapped out their beds since the late 19th century, and the same era’s nautical charts can help current geographers keep track of shoreline changes. Color map: Gauld (1774), Lower Keys. When Loren McClenachan came across Gauld’s maps nearly 10 years ago, in the archives of the United Kingdom Hydrographic Office, she knew they’d prove similarly useful. “There was a lot of ecological information in them,” McClenachan, the study’s lead author and an environmental studies professor at Colby College, says. It did take her a while to figure out exactly how best to make use of them, though. Gauld had been particularly careful about coral in the Keys, noting exactly where and how deep down the reefs were—the 18th century version of high-resolution data. Meanwhile, a number of recent surveys, including the National Oceanic and Atmospheric Administration’s Unified Florida Coral Reef Tract Map and the United Nations’ Millennium Coral Reef Mapping Project, had done satellite sweeps of that same area. “We figured out that we could compare [Gauld’s observations] to the satellite data,” McClenachan says. They then used a composite of three modern satellite surveys to check whether it was still present in that spot. “We estimate a 52 percent loss in the occurrence of corals in the Florida Keys over 240 years,” the researchers write. "An accurate chart of the Tortugas & Florida Keys or Martyrs surveyed..."
published by William Faden (1790), and based on surveys conducted by George Gauld in the area from 1773-1775, who had been assigned by the British Admiralty to chart the waters off West Florida, where he was taken prisoner by Spanish forces during the siege of Pensacola, in 1781. When the researchers examined their results more closely, they also found that the coral vanished asymmetrically: the areas that lost the most reef cover tended to be closer to the shore. Meanwhile, the farther out you went, the more coral stuck around. This also posits a diagnosis for the disappearance. “We can’t pinpoint the reasons for decline—we just have these snapshots of then and now,” says McClenachan. “But other lines of evidence make it seem likely that those [inshore corals] were lost due to human impacts,” such as dredging, shoreline hardening, and the rechanneling of the Everglades, which changed the salinity of Florida Bay. A strong spatial gradient to coral loss in the Florida Keys. (B). Modern and historical coral occurrences in the Florida Keys. The color of dots corresponds with the five delineated coral zones. (C) Enlarged area demonstrates the loss of coral from Florida Bay (red). (D) Enlarged area (Bahia Honda) demonstrates the loss of the nearshore patch reef (yellow) and the persistence of coral in the reef crest zone (blue). For (C) and (D), corals that no longer remain are indicated with an X. (E) Percent loss by zone. Bars represent the mean estimate of loss derived from three distance thresholds diameters (0.25, 0.5, and 0.75 km). Error bars represent the SEs across those three estimates. Coral today also live precarious lives: pollution is choking them out, careless boating is breaking them up, and climate change is warming and acidifying their habitats, killing off the algae that bring them to life. If you’re used to reading coral studies, which regularly describe 75 percent declines in live coral over mere decades, a 52 percent loss over centuries might not seem so bad. But McClenachan is quick to point out that this study is diagnosing a completely different category of disappearance: this 52 percent loss happened so completely, we no longer even look for coral in those places, because we don’t remember that it was ever there. “It’s not a decline in live coral,” says McClenachan. To McClenachan, this recontextualization is part of what makes historical studies meaningful. “If you don’t know about change, you’re not going to recognize it,” she says. It’s not just that we have a better idea of the destruction we’ve caused: expanding our historic imagination allows us to improve research in the present, and to think bigger for the future. Currently, the Florida Keys are very invested in restoring coral reefs, re-seeding baby corals on existing reef sites and researching ways to make species more resilient as oceans change. Knowing where the coral used to be could influence these plans. “If you don’t know that it’s there it doesn’t make sense to look for it,” McClenachan says. But if you know that George Gauld once kept his eyes peeled, you might start, too.